Yang Su-hsia (right) gave a lecture to students of University of the Ryukyus at the campus in Nishihara on June 27. The Senkaku Islands and Liancourt Rocks disputes have been attracting international attention. Japanese, South Korean and Taiwanese researchers have launched a project to create common teaching materials on the topic of maritime territorial disputes. The materials are for junior high school students. The researchers propose that we look at national borders from the viewpoint of ordinary citizens and their livelihoods. The project aims to encourage the younger generation to share an understanding of history with their counterparts in these countries and districts by using the teaching materials in schools. Peaceful coexistence is the goal. The researchers started lectures for college and university students this March in which they considered shared teaching materials. Taking on board ideas from the students, the researchers have tried to overcome differences of opinions across borders. University of the Ryukyus Associate Professor Takeshi Yamaguchi, Konkuk University Associate Professor Park Sam Hun and Southern Taiwan University of Technology Associate Professor Yang Su-hsia are working on the project. They want to expand it in future to also reflect the Chinese standpoint. The researchers deliver lectures for college and university students in the three countries and districts. They explain the different ways that textbooks in these countries and districts describe the territorial disputes and how the people react to “territory inherent to” their countries and districts. They reiterate the importance of discussing issues as global citizens who think beyond national borders. Some students in the countries and districts involved suggested that ongoing exchange and discussion is important in order to resolve disputes. Others said that people in each of the countries and districts should try to reach agreement after they sufficiently understand each other’s position based on historical and objective judgment. Some said the governments should assert their ownership more strongly. 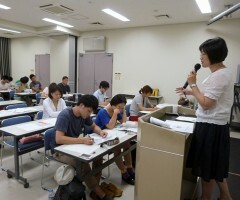 The researchers held an open study session at Okinawa Christian University on June 26 in which they introduced the content of the lectures and reported upon their research results. The Asia Peace and History Research Institute of South Korea supports the project with assistance from the Northeast Asian History Foundation.